Love this time of year, when we immerse ourselves in mulling spices, squashes, pomegranates, persimmons, and pears! Let me introduce you to the Forelle pears. The light green pears with red freckles are an heirloom variety with roots in Germany. Lucky for us, we can get these little pears from farms in the Northwest from October through March. Or, you can visit Melissa’s Produce by visiting their website at www.melissas.com. Forelles are firm and crisp, even when ripe. Their hardiness and travel-worthiness makes them the perfect snacking fruit. Due to the small size of the pears, most people shy away from using these pears for cooking. What Forelle pears lack in size, they make up for in taste: sweet but with a hint of cinnamon. The firmness of the pears also makes them great for poaching and baking. 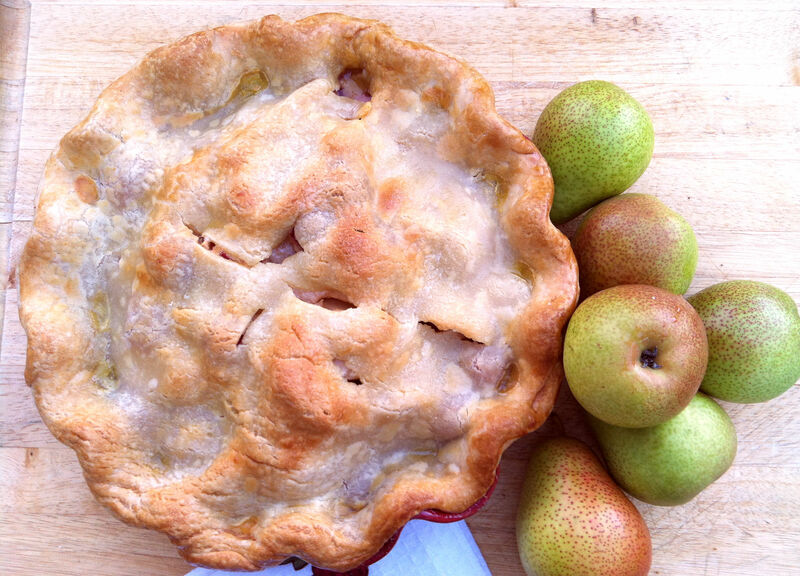 This pear pie recipe is a cinch with pre-made pie crust, but mastering your own perfect pie dough recipe would make a great seasonal project. 1. Dust your surface with some flour. Roll out one pie crust according to package directions. 2. Fit that pie crust into your 9 inch pie pan. Trim edges and place in the freezer to chill. 3. In a large bowl, thoroughly mix together the sugar, corn starch, salt, and cinnamon. 4. Prepare your pears: peel, halve, and core them. Slice the pear halves into ¼ inch slices. 5. 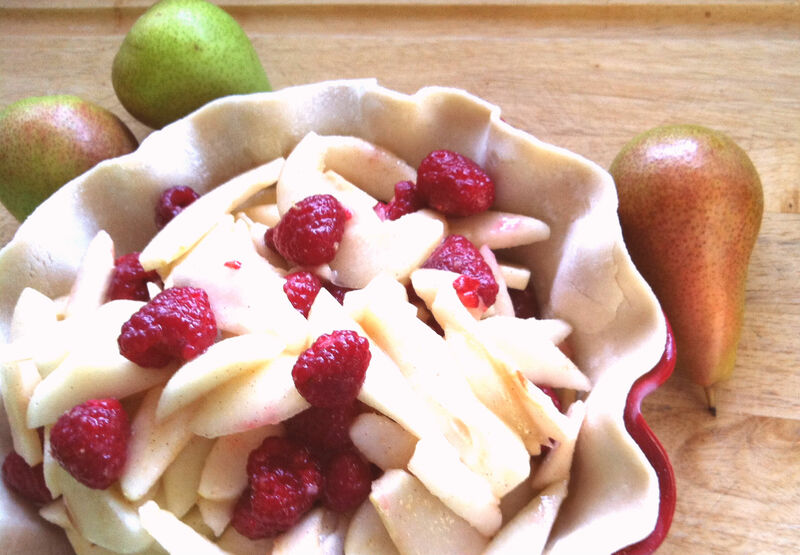 Add the pears, raspberries, and lemon juice to the bowl with the sugar and cornstarch mixture. Toss to coat evenly. Don’t be afraid to use your hands. 6. Carefully spoon the mixture into your chilled pie crust. 7. Evenly scatter the cubed butter over the mixture. 8. Dust your surface again for the top crust. Roll out according to package directions. Cover your pie with the roll out dough. Crimp and trim edges. 9. Whisk together the egg yolk and water. Evenly brush the top with the egg wash.
10. Sprinkle the top generously with sugar. Chill in the freezer for 30 minutes. 11. Preheat your oven to 400°F. 12. Bake for 20-25 minutes at 400°F. 13. Reduce the temperature to 375°F and bake until golden brown, about 30 minutes, rotating half way through. If the top begins to brown too much you can always cover with foil to prevent over browning. 14. Allow to cool completely before serving.